This is, unfortunately, often true in Vermont as well. Perhaps it’s time to form a coalition of organizations to support a sustained campaign of what Richard Cialdini refers to as “persuasion psychology,” a.k.a., choice architecture or “nudges.” In any event, something must be done soon — we’re going no where fast on many of these issues. The site MyBikeLane is a sort of user-generated catalog of pictures of bike lane misuse in cities all over the world. 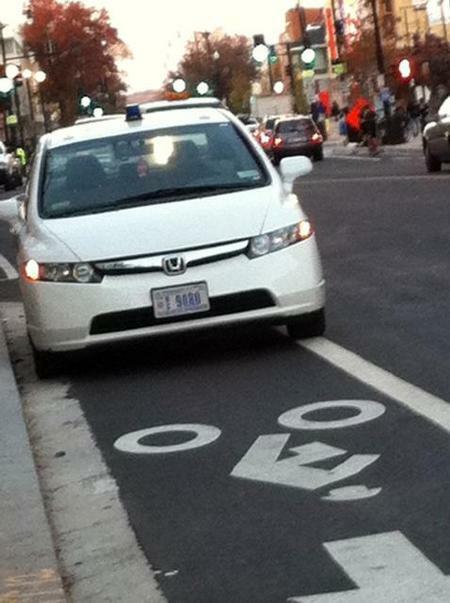 In the photo above, for example, a parking enforcement officer has completely blocked the bike lane. What a great idea! 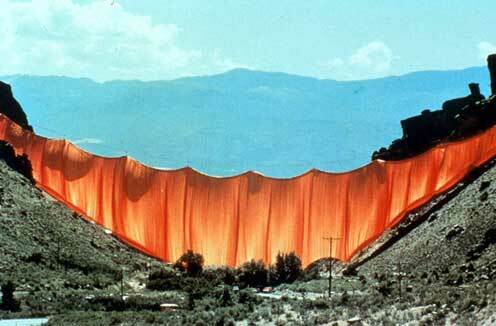 For centuries public shame has proven to be an effective tool for stimulating behavior change. Add in social networking and the embarassment of the corporate or government employers captured here and I foresee improvement for bike commuters around the world. Do you have a photo to contribute? Unfortunately, Vermont has few marked bike lanes, but I’m still planning to be on the lookout. True, the nine images selected here by Carl Schoonover are stunning, but what intrigues me more is the obvious passion for his work that is communicated in his written descriptions and stories for the images. Elegance often begets meaning and understanding. 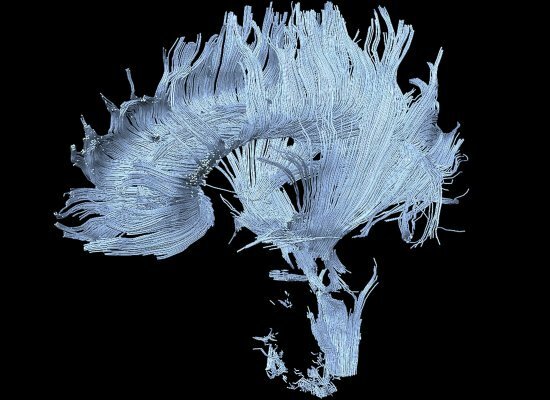 In a fit of candor, Nobel laureate Richard Axel once pronounced that “science without enchantment is nothing!” In my new book Portraits of the Mind: Visualizing the Brain from Antiquity to the 21st Century (Abrams), I examine this special relationship, and share the images and stories I have come to love–many of which were, until now, only available to people in the field. If only by name, ‘neuroscience’ can be off-putting. An invitation to a guided tour, of words and images depicting humanity’s emerging understanding of a key part of what makes us each who we are, is very appealing. I’m not really an example of a hard sell for books on human behavior or the brain, but nonetheless, Schoonover’s new book has been added to the top of my ‘next-trip’ list for the bookstore or library. As pleased as I was to see the new Jeffords building at the University of Vermont featured in The Chronicle of Higher Education, I must confess to being somewhat disappointed by this piece. 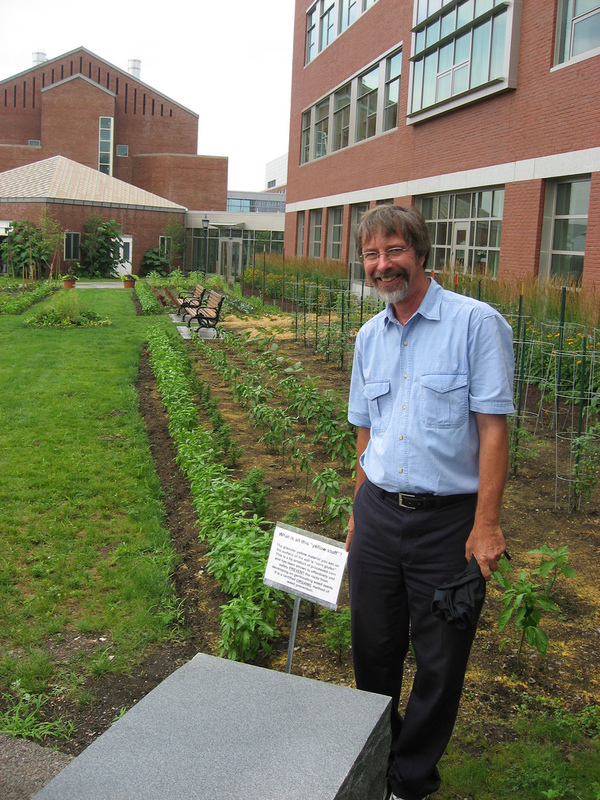 Although Dean Tom Vogelmann appears amiable and approachable in the photograph above, the remaining photos do little to convey the “functional elegance” of the exterior or interior design of the new home for plant biology, soil sciences, and life sciences at UVM. The more important omissions to my mind, however, are details on the myriad steps and design choices made to enable a large building with teaching science labs to minimize its environmental footprint and to be potentially eligible for LEED gold certification. I yearned to know more about how that was accomplished. True, the teaching landscape featured in the article is interesting, yet I’ve begun to fear we fall further behind in the battle to minimize the effects of climate change whenever we miss an opportunity to inform and educate. I expected more from this publication. Disclosure: I currently serve on the Board of Advisors for the UVM College of Agriculture & Life Sciences. A victory for anyone who likes healthy food, soil, and water! 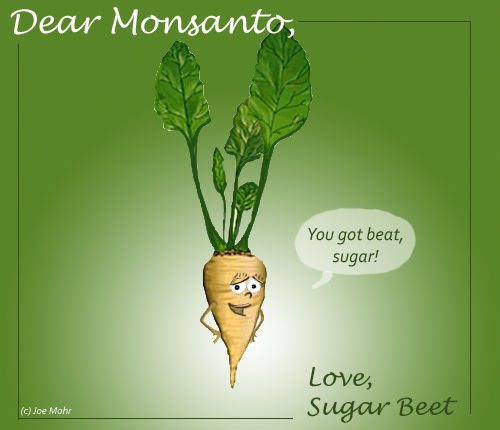 Monsanto’s sour plans for the sweet beet were spoiled as a federal judge banned genetically modified sugar beets. This is great news and hopefully a large step forward to getting food production back on a less toxic track. For a long time now, I’ve harbored the desire to develop my editorial cartoon inner self. This timely take on the court ruling against Monsanto’s genetically modified sugar beets is a perfect example of why. Despite the focus on the centrality of communication and cooperation, with which I could not agree more, I must confess to disappointment with Ridley’s optimism that our collective mind and technology will continue to fuel human progress. Then again, that may be because the two of us understand the meaning of “human progress” in different ways.